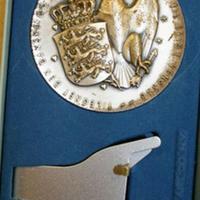 Obverse: Danish crest and eagle with stars and text " Tilegnet Den Danske Og Amerikanske Befolkning Til Evigt Vensksb". Reverse: Log cabin and Abraham Lincoln portrait on bottom with text "Rebild National Park Society INC Commemoration American Independence Day". 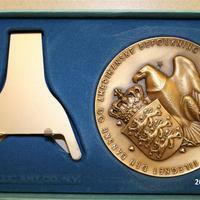 Paper inside box says medal was for 60th anniversary. 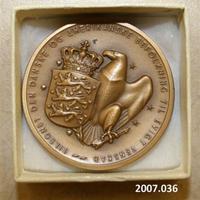 Obverse: Danish crest and eagle with stars and text " Tilegnet Den Danske Og Amerikanske Befolkning Til Evigt Vensksb". Reverse: Log cabin and Abraham Lincoln portrait on bottom with text "Rebild National Park Society INC Commemoration American Independence Day". Paper inside box says this medal was for 60th anniversary. 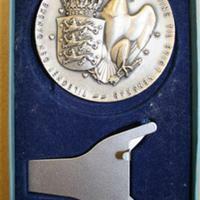 Obverse: Danish crest and eagle with stars and text " Tilegnet Den Danske Og Amerikanske Befolkning Til Evigt Vensksb". Reverse: Log cabin and Abraham Lincoln portrait on bottom with text "Rebild National Park Society INC Commemoration American Independence Day". 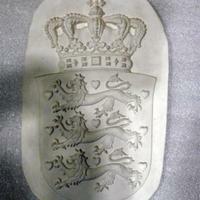 Different medallion for the Danish Crest. The plaster has a large crack on the back. Says "24 Mai, 1935" on the relief. 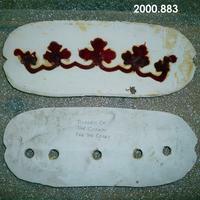 Two piece small plaster mold with rubber inside. 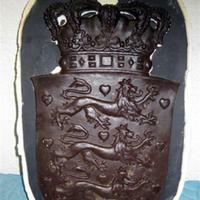 "Border of the crown for the crest" written on the molds surface. There are holes in one side of the mold. 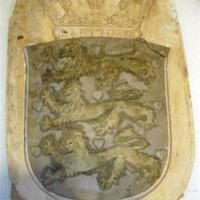 Plaster relief of the Danish coat of arms, crown on top and three lions below. Oval shape relief. Danish coat of arms. 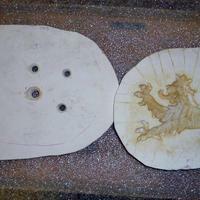 Lion section is made of rubber and set on top of the plaster. 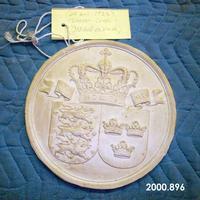 Two piece mold for the lion for the Danish Crest. There are holes in one side of the mold.